The rain kept me awake during the night, so I was surprised to wake and find the pavements dried out in time for the market this morning, though that deep puddle under the railway bridge is still there. There were some lovely natural pine wreaths and garlands in the market today, but I averted my eyes because these treats are reserved for closer to Christmas. Last week, I pruned this fig which grows in a nineteenth century feed bin that I bought for a couple of pounds at the car boot sale in the Exeter Cattle Market years ago. 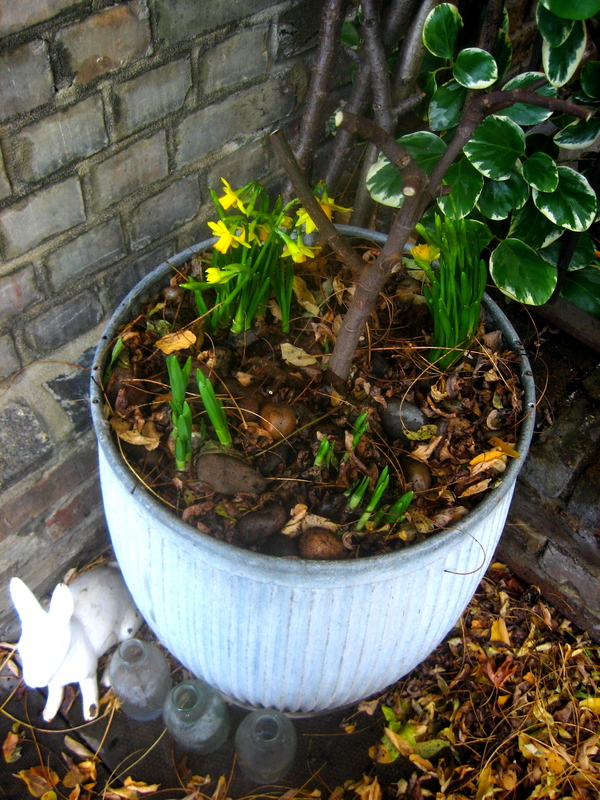 Now the fig just looks like a bare twig stuck in the ground, so today at the market I bought four pots of miniature daffodils (tete a tete) for a fiver, already sprouted, to alleviate the wintriness, and as a small antidote to the sleeting melancholia of late November. Some gardeners might consider this intervention cheating but I if I plant bulbs any other way the squirrels eat them. The stones in the pot are to prevent the foxes digging out the fig as they did last summer. Between the squirrels and the foxes, there is a remarkable amount of wildlife to circumvent for such an urban garden.